The question is: do young people simply have no respect for the law anymore – or is there just a shortage of people there to uphold it? Chris Webb, Lancashire’s deputy police and crime commissioner and Labour’s candidate for Blackpool North and Cleveleys at the next general election, said it was a “combination”, with years of cuts to police, schools, and councils all having a negative effect. Mr Webb, inset, said: “We are seeing the sharp edge of austerity. When I grew up, police used to put on football camps and stuff for us to engage with. It got us off the streets. Unfortunately, there has been that many cuts to local government, kids have nowhere to go. Police used social media to say they would be stepping up patrols in Cleveleys, and using a dispersal order – in place from 5pm on Friday until the same time on Sunday – to boot young miscreants out of the town centre. 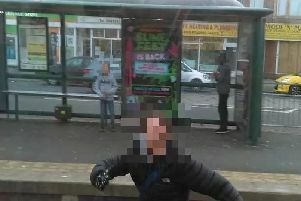 Officers later shared a picture of an empty bus station and said they had “met with a small group of youths at the start of the” crackdown “and they were swiftly moved on”. The next day, Heritage Tram Tours, which runs historic trams along the Fylde coast, complained that youths – who were pictured pulling their hoods over their faces and on the tracks – were “deliberately blocking the tramway” at Thornton Gate. 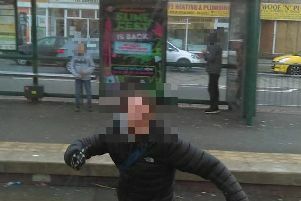 Tram passenger Adam Kean said he “was on the last trip from Fleetwood” and said he saw “youths messing around near Aldi, jumping around on the tracks”. And hours later, there were reports of vandals wrecking Jubilee Gardens. Local councillor Rob Fail said: “The police are doing what they can, and they are putting more resources on and I have seen that. They have been parked outside the bus station and monitoring what’s going on, but they can’t be everywhere. In the past 12 months, the most reported crime in the area has been anti-social behaviour, official stats showed. “No further action” was taken in almost 70 per cent of all crimes, mainly because no-one was caught. Not being able to prosecute a suspect was also cited in more than a quarter of cases, with possible reasons including a lack of evidence or the suspect being below the age of criminal responsibility. Nobody at Lancashire Police could be reached for a comment yesterday.